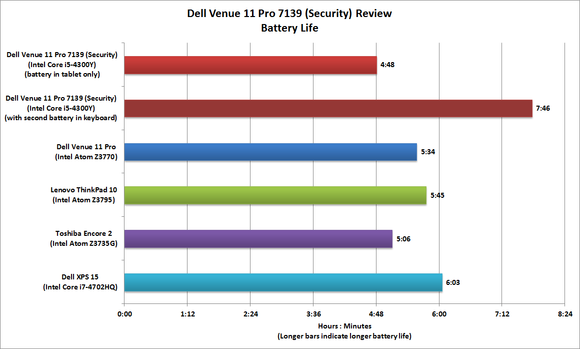 What happens when you put an Intel Core i5-4300Y in an 11-inch tablet like the Dell Venue 11 Pro? It gets really, really fast. 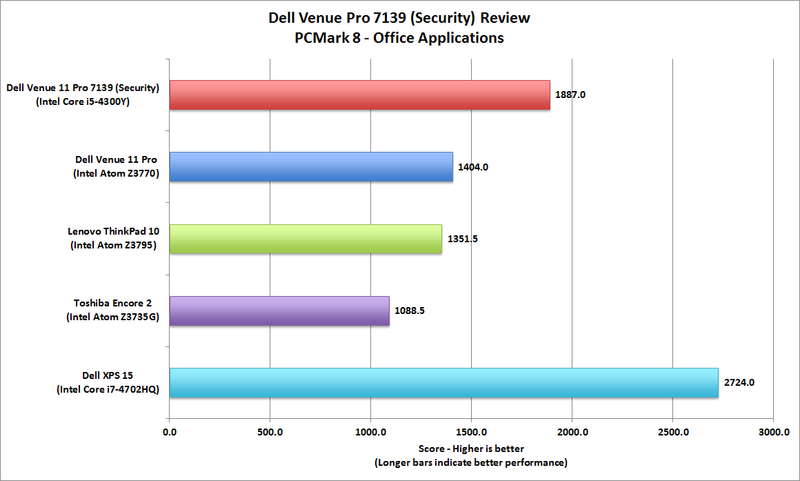 Indeed, having used the previously-reviewed Atom-based version of the Venue 11 Pro, I can attest to a rather significant jump in performance. The “Pro” suffix indicates that this tablet runs Windows (Dell’s Venue tablets are Android devices), and the “7139 Security” tag adds a whole list of features not found in the more consumer-oriented Venue Pro. These include Intel vPro and TPM (Trusted Platform Module) support (for hardwired security and remote management), and a fingerprint scanner and smart card reader to keep the bad guys out. 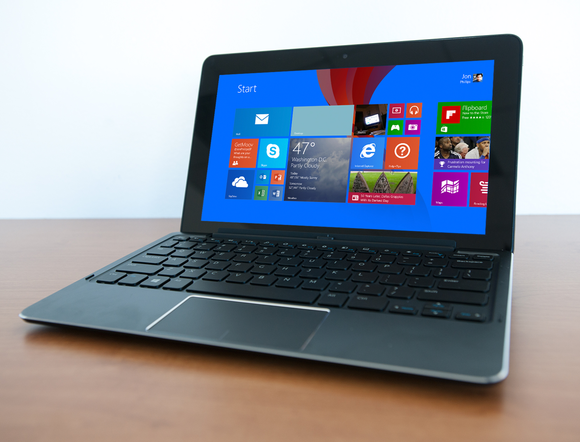 The optional keyboard dock turns the Venue 11 Pro into a small Ultrabook. 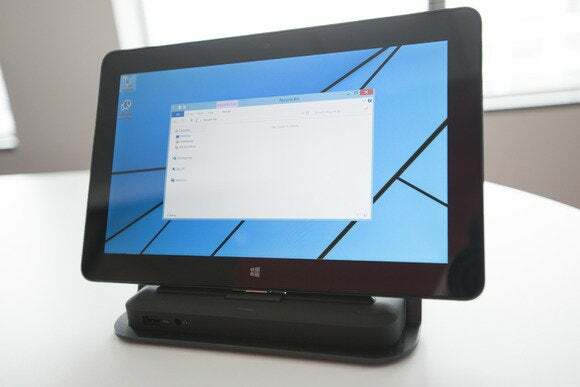 In its basic form, the Venue 11 Pro is a widescreen Windows 8 tablet with some clever docking options: A small keyboard, a super-thin keyboard, and a port-laden pedestal that can transform it into a high-powered Ultrabook or an under-screened, all-in-one desktop. I say under-screened, because as large as the 10.8-inch, 1920x1080 display seems when it’s in your hand, it’s rather tiny when you have a full-sized keyboard and mouse in front of it. You might also be interested in Laptops for work and play: the differences that matter. The Venue 11 Pro was only doable in AIO configuration for weak-eyed me with the keyboard tucked in a tray underneath my desk. Dell’s Tablet Dock does support dual display configurations, however, and it’s equipped with both HDMI (max resolution of 1920x108) and DisplayPort (max resolution of 2560x1600). This optional dock ($140) can transform the Venue 11 Pro into a small all-in-one. Dell’s model 7130 and 7139 can drive a second display via HDMI or DisplayPort. The 7139 (Security) model is a higher-end configuration priced at $1081. In addition to the aforementioned quad-core CPU and security features, it also comes with 4GB of DDR3/1600 memory and a SanDisk 128GB m.2 SSD. The tablet measures 0.6 inches thick and weighs in at 1.85 pounds sans keyboard. As tablets go, this one feels a bit thick, but I didn’t find it overly heavy. Then again, I tend to prop a tablet on my chest while lying down, or rest my elbows on the counter while I hold the tablet. Folks who hold the tablet without extra support might disagree. If the fingerprint scanner doesn’t provide enough security for your needs, you can use a smart card with this Venue 11 Pro. The Venue 11 Pro 7139 features an 8MP rear-facing camera and a 2MP front-facing webcam. The right side is home to the power button, reset pinhole, microSD card slot (with a pinhole release), a micro-USB 2.0 port for charging the unit, and a mini-HDMI port. 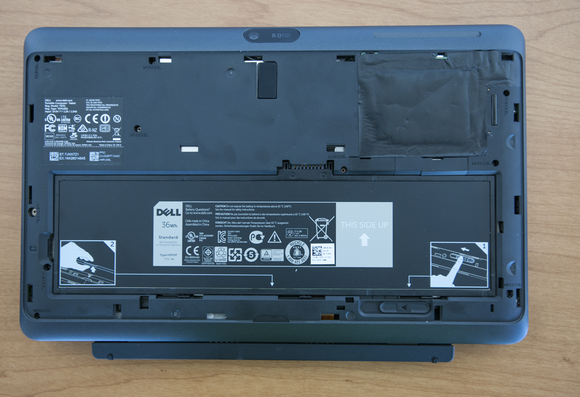 The lower edge of the tablet has only the docking port and auxiliary battery connection points. On the left are a full-sized USB 3.0 port, the volume control rocker, and the headset jack. The top is occupied solely by circulation vents—a Core i5 needs to breathe. Dell’s best tablet is on the chunky side (shown here attached to the thicker of its two optional keyboards). The bottom of the Venue 11 is largely given over to a pressure-fit plastic panel that pops off to reveal the 36-watt-hour battery. It also facilitates access to other components, though the only thing you can get to without further disassembly is the micro-SIM card for optional cellular broadband. The Venue 11 Pro 7139 also supports 802.11ac Wi-Fi (via an Intel Dual Band Wireless-AC 7260 adapter), Bluetooth 4.0, and WiDi/Miracast (for wireless video streaming to displays that support that standard). Worried about battery life? This is one of the few tablets that lets you swap a dead one out for a fresh one. Our test unit came with the 1.5-pound Mobile Keyboard ($160), which also houses a supplementary 28-watt-hour battery. The significantly lighter (0.72-pound), Surface-style Slim keyboard is also available for $110, but it does not include a second battery. The Mobile Keyboard types nicely for its size, and the keys have good bit of travel. The one-piece touchpad, however, proved idiosyncratic at registering clicks when pressed in the corners, versus the center of the click area. Swiping, cursor movement, and tapping, on the other hand, registered without a problem. 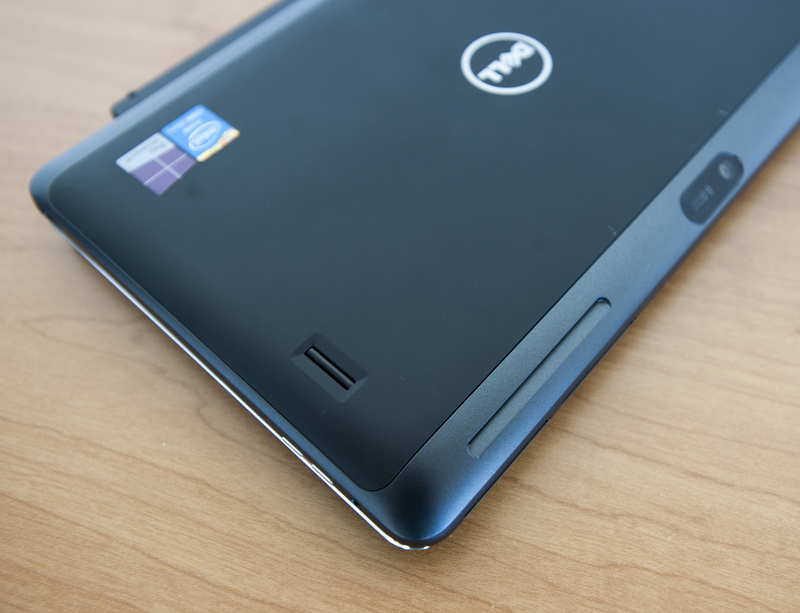 Dell also shipped its $27 Active Stylus, which provides Wacom-like abilities to the unit. 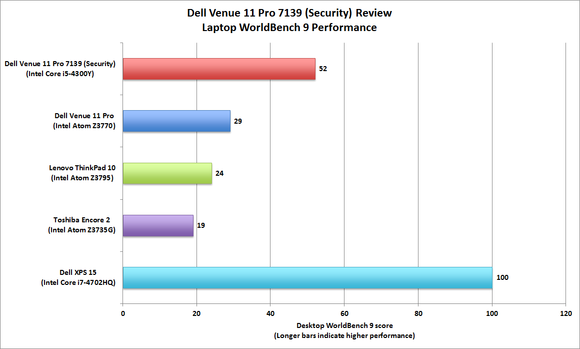 The Venue 11 Pro model 7139 scored a very un-tablet-like Laptop WorldBench 9 score of 52—a full 23 points higher than the Atom Z3770-based Venue 11 Pro we tested earlier this year. It felt super-lively in my hands-on and played even high bit-rate 1080p movies like butter. In spite of its faster CPU, the model 7139 managed to run for 4 hours and 48 minutes by its lonesome, and 7 hours, 46 minutes with the Mobile Keyboard keyboard/auxiliary battery attached. 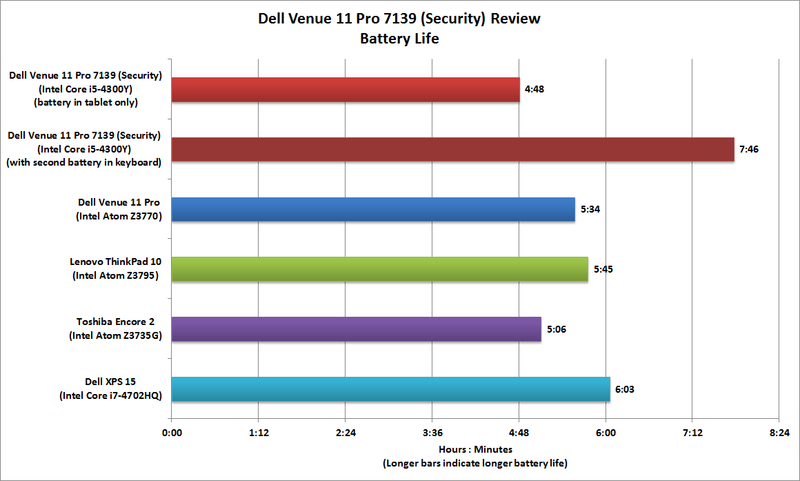 The Venue 11 Pro 7139 (Security) is the fastest Windows tablet we’ve tested. Sadly, the Core i5-4300Y’s integrated graphics (Intel HD Graphics 4200) don’t game. The tablet struggled to reach 15 frames per second with BioShock Infinite, even with the resolution dialed down to 1024x768 and image quality at low. Sound, on the other hand, was surprisingly good. Apparently the air spaces required to keep the i5 cool helps with bass response. 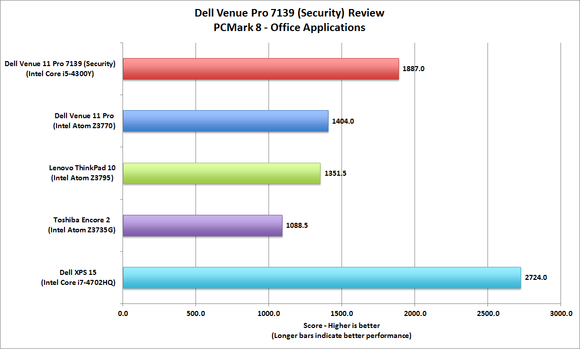 The Venue 11 Pro sounds beefier than many full laptops I’ve reviewed. Yes, the games you can’t play will sound great! 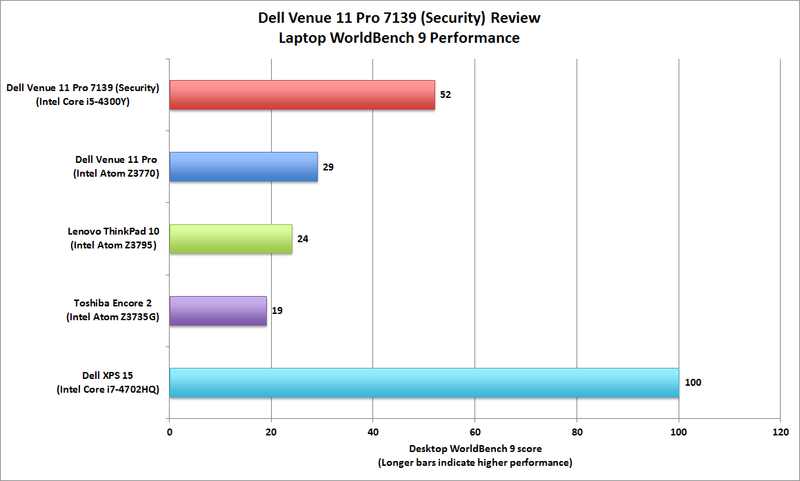 Dell’s secure tablet delivered an excellent performance with our productivity app benchmark, too. If you’re into the Venue 11 Pro’s form factor, versatility, and accessories, but don’t care as much about—or can’t afford—this model’s performance and security features, a host of less-expensive configurations are also available. Dell’s website is confusing to navigate, but you should be able to find a model that fits your budget if you dig around. The Venue 11 Pro is warrantied for a single year by default, but you can purchase up to three years—including onsite service—for $216. If you need a business tablet that can work all day and into the night, Dell’s Venue 11 Pro 7139 (Security) with its keyboard dock is the one to buy. The Venue 11 Pro 7139 (Security) is a versatile business tablet/laptop/mini all-in-one that’s surprisingly usable in all three orientations—provided you can live with the heft and smallish display (as a desktop without a second monitor, that is). 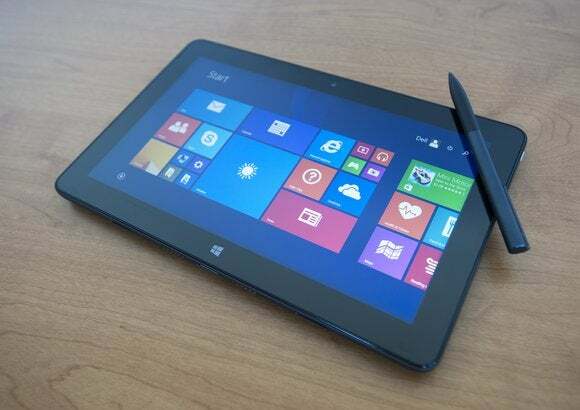 This high-end model proved particularly adept at movies and presentations, but it’s a highly capable, very secure Windows 8 tablet in nearly all aspects. The package reviewed here, which includes several options including the stylus and keyboard dock with supplemental battery, costs $1081. That’s a lot of green, but its performance justifies its price tag.